The main difference between androecium and gynoecium is that the androecium (or stamen) refers to the male part of the flower whereas the gynoecium (or pistil or carpel) refers to the female part. Androecium and gynoecium are the two, opposite reproductive organs of the flower, the sexual reproductive structures in angiosperms. Androecium is also called stamens, which comprises of anther and filaments while gynoecium is also called the pistil or carpel, which comprises of stigma, style, and ovary. Moreover, androecium produces pollen grains while gynoecium produces ovules. Androecium is the male reproductive organ of the flower, which produces micropores. It comprises all the stamens in the flower. 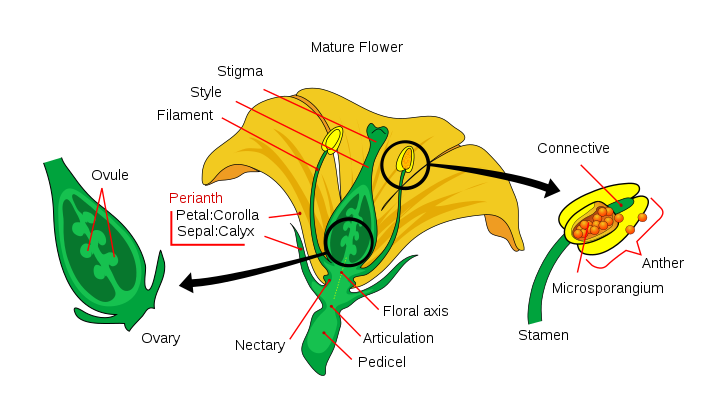 Each stamen is made up of a filament and an anther. A ring of stamens occurs in the middle of a flower. Filament is the stalk which holds the anther away from the flower. Each anther has two lobes; each connects to the filament at the base. A sterile tissue called the connective holds the two lobes together. Typically, an anther has four microsporangia, which are also called anther sacs. Tapetum, a nutritive tissue, lines each microsporangium. The diploid microgametocytes in the microsporangium undergo meiosis to produce haploid microspores. The mitotic divisions of microspores produce immature microgametophyte, surrounded by a thick wall. This structure is called the pollen grain. The opening of the anther releases pollen grains to the outside. The gynoecium is the female reproductive organ of the flower, which produces macrospores or ovules. Ultimately, it develops the seeds and fruit. Gynoecium occurs at the center of a flower and is surrounded by the stamens. The three components of a gynoecium are stigma, style, and ovary. 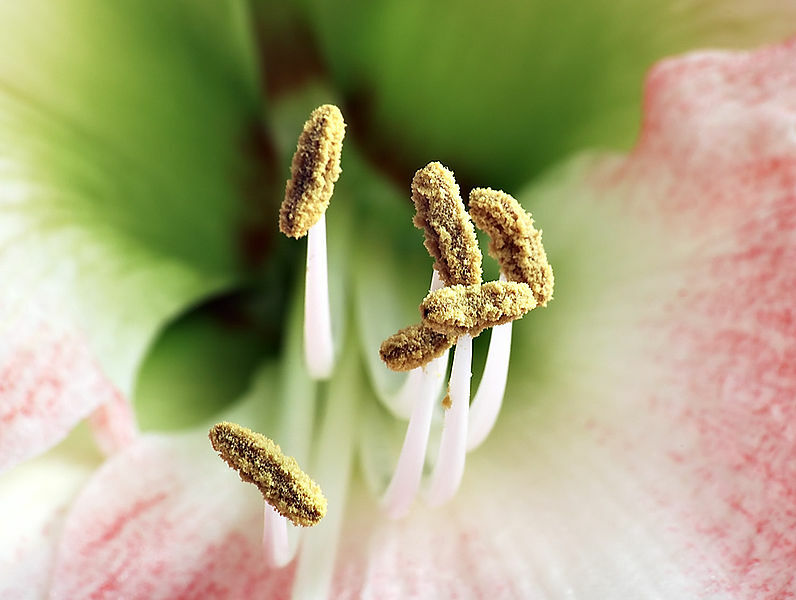 Stigma occurs at the tip of the style and it is sticky and feathery to capture pollen grains. The style is the stalk, which holds the stigma away from the flower. The enlarged, basal portion is the ovary. It may contain one or several ovules, the integument megasporangia. The cells inside megasporangia undergo meiosis to produce megaspores. Megaspores develop into the female gametophyte, which produces eggs. Androecium and gynoecium are the two opposite reproductive organs of the flower. They are responsible for the sexual reproduction of flowering plants. They comprise gametocytes, which undergo meiosis to produce gametes. Androecium refers to the male fertilizing organ of a flower, typically consisting of a pollen-containing anther and a filament while gynoecium refers to the female organs of a flower, comprising the stigma, style, and ovary. Androecium is the male reproductive organ of the flower while gynoecium is the female reproductive organ. Therfore, this is is the main difference between androecium and gynoecium. Stamen is another name for Androecium while pistil or carpel are other names for gynoecium. While androecium has anthers and filaments, gynoecium has stigma, style, and ovary. Another difference between androecium and gynoecium is their gametocytes; androecium contains microgametocytes while gynoecium contains megagametophytes. Androecium produces microspores while gynoecium produces macrospores. Furthermore, microspores develop into pollen grain while megaspres occur inside the ovule. This is also an important difference between androecium and gynoecium. One more difference between androecium and gynoecium is their role in pollination. Lengthened filaments in androecium facilitate the dispersal of pollen grains while the stigma of the gynoecium becomes sticky to keep the pollen grains on it. Furthermore, androecium has no function in fertilization while fertilization occurs inside the ovary of the gynoecium. To add more, the androecium has no function in the development of seeds and fruit while gynoecium facilitates the formation of seeds and fruit. Also, flowers without an androecium are called pistillate or carpellate while the flowers without gynoecium are called staminate. While androecium is the male reproductive organ of the flower, gynoecium is the female reproductive organ. Androecium produces microspores, which develop the male gametocyte while gynoecium produces megaspores, which develop the female gametophyte. 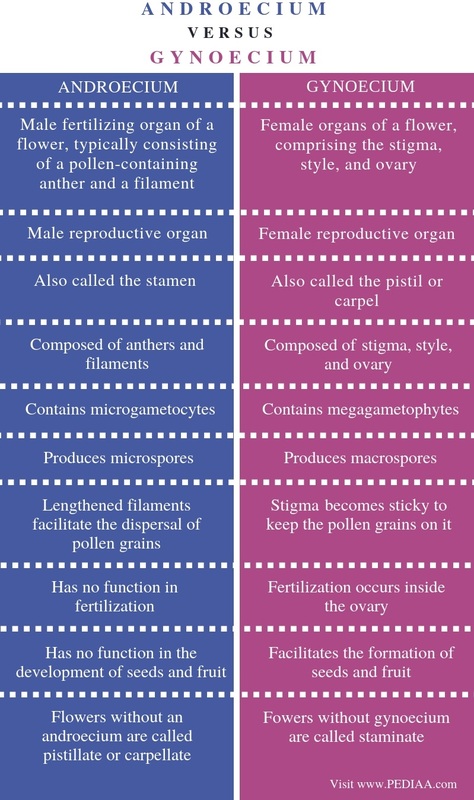 This is the main difference between androecium and gynoecium.